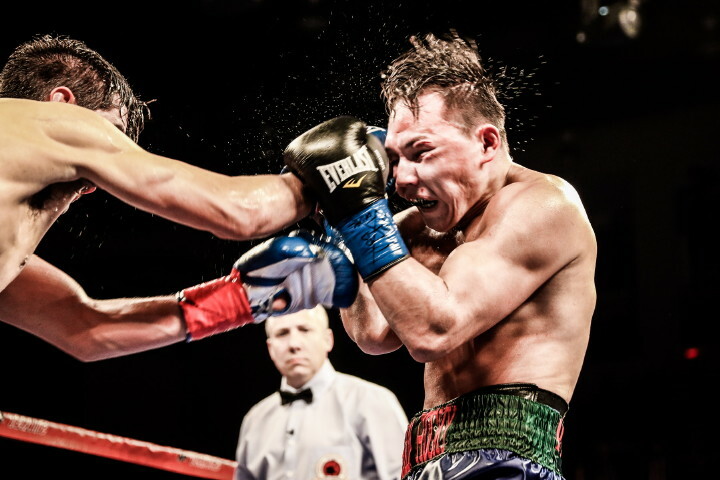 (Photo credit Amanda Westcott/SHOWTIME) VERONA, N.Y. John Molina outpunched Ruslan Provodnikov in an all-action fight by revealing a new weapon in his arsenal, a sharp and steady jab. Molina captured a surprising unanimous decision in a 12-round junior welterweight bout that featured fierce exchanges throughout Saturday on SHOWTIME from Turning Stone Resort Casino in Verona, N.Y.
Molina and Provodnikov promised a war, and they delivered. But what surprised many was the volume of punches and effective jabbing from Molina (29-6, 23 KOs), a veteran more known for engaging in brawls than his boxing prowess. Molina threw nearly 1,110 total punches, including 643 jabs compared to just 265 for Provodnikov, who failed to close the range on his naturally bigger opponent. “We knew we had to outwork Provodnikov,” said the 33-year-old Covina, Calif., native. “It was a fight that we needed. Ruslan Provodnikov is a very notable name. He’s a tough, tough guy. He kept moving forward. Molina vs. Provodnikov was scored 116-112, 117-111, 115-113. The judges agreed on nine of the 12 rounds, a relatively high percentage according to SHOWTIME analyst Steve Farhood. “Today the decision was the right one,” Provnikov said. “Molina won the fight – he was better tonight. Everything was scored the way it should have been. “We expected that he was going to box, he was going to move. We expected him to do that. It wasn’t my night. Maybe I don’t have the same hungriness as before. I’m not going to make excuses, but it was hard for me to find my groove tonight. “I don’t think it’s that (the layoff). There are no excuses. I lost the fight tonight. I couldn’t find the hungriness. I have to sit down and think of why that happened. In undercard action on SHO EXTREME, Willie Monroe Jr. (20-2, 6 KOs) won a unanimous decision (96-92, 95-93, 99-89) over John Thompson (17-2, 6 KOs) in a 10-round middleweight matchup of former world title challengers. Monroe scored two knockdowns, one in the second and another with a straight right jab in the fifth. In the opening bout on SHOWTIME BOXING on SHO EXTREME, Russian heavyweight Andrey Fedosov (29-3, 24 KOs) scored four knockdowns en route to a sixth round TKO (1:33) of Mario Heredia (11-2, 9 KOs, 1-2 in WSB). Saturday’s event from Turning Stone Resort Casino was promoted by Banner Promotions and DiBella Entertainment. Saturday’s SHOWTIME CHAMPIONSHIP BOXING tripleheader replays Monday, June 13 at 10 p.m. ET/PT on SHOWTIME EXTREME. The SHOWTIME BOXING on SHO EXTREME telecast replays Tuesday, June 14 at 10 p.m. ET/PT on SHO EXTREME. Brian Custer hosted the SHOWTIME telecast, with Mauro Ranallo calling the action, Hall of Fame analyst Al Bernstein and former two-time world champion Paulie Malignaggi commentating and Jim Gray reporting. Barry Tompkins and Steve Farhood called. the SHOWTIME EXTREME action. In the Spanish simulcast, Alejandro Luna called the blow-by-blow and former world champion Raul Marquez served as color commentator. The executive producer of SHOWTIME CHAMPIONSHIP BOXING was David Dinkins Jr. with Bob Dunphy directing.